The people of old Hanoi is precious and subtle in lifestyle, behavior and cuisine. Trang An people (People of old Hanoi ) believe that dining is not only tasting but also smelling, seeing, hearing and soul. So Bun Thang is one of favor food in Hanoi. 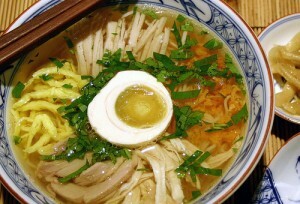 Bun Thang that’s mean vermicelli soup so you can see that soup is the most imprortant of this food. Bun Thang also mean cordial coz only with one bowl of Bun can have you feel stronger. The broth is made carefully of chicken bone, pig bone or shrimp. 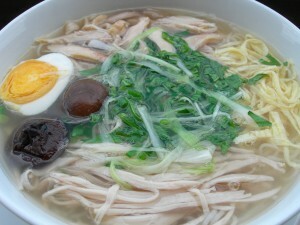 The most important in this food is keep broth look “ pure” but still keep full of sustenances. The shrimp is often hight quality, the broth must have shrimp taste . The Bun Thang have to look beautiful, the image of Yin Yang and five element. The white color of Gio fibers and chicken. The yellow color of fried egg like paper , sliced and chopped. The red color of shrimp. The brown of dried radish and green of onion. All of colorful ingredients is decoreated for bowl of Bun look like a beautiful picture. Bun Thang must use HOT broth like another kind of Bun, and the smell make you hungry. You should eat Bun Thang with shrimp sauce or “ Ca Cuong” sauce that change the taste of Bun Thang very special that I think you couldn’t forget. 144 D2 Giang Vo, Dong Da, Hanoi. The best restaurant of Bun Thang is Ba Am at Cua Nam street.